The 10 Best Steakhouses in Kansas! If you find yourself in Kansas and in search of a high-quality, juicy steak, you’re in luck! The best steakhouses across the state offer up flavorful varieties of delicious beef, some sourced locally. 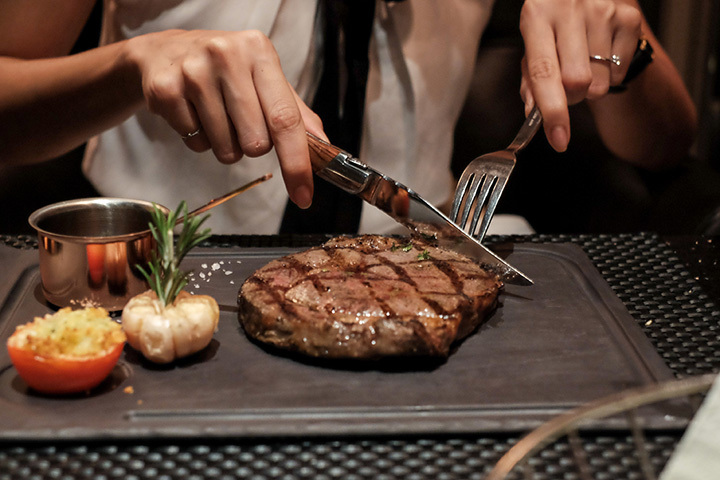 From strip steak to rib eye, you’ll find your favorite cuts and excellent service at these 10 great steakhouses in Kansas. In the far southeast corner of Kanas is a family-owned steakhouse located in Baxter Springs. This restaurant has everything that makes a good steakhouse, good service, good food and great steaks. Not only that, but the atmosphere is very family-friendly. It doesn’t matter what cut of a good Kansas steak you order, all the steaks at the Metropolitan Steakhouse in Leavenworth are served juicy and hot. An accommodating menu guarantees everyone will be served a something good. You will get excellent service and care at the Siena Tuscan Steakhouse in Wichita. This steakhouse is located in the Ambassador Hotel and offers an incomparable dining experience. The steaks are served in a true Tuscan-style flavor and are mouthwateringly delicious. It’s always a good day when you dine at the Hereford House in Shawnee, and it has been for over 50 years. The steaks are hand cut, aged, cooked to perfection and served exactly how you like it. A whole lot of good food is served at J. Wilson’s Restaurant in Lawrence but it’s the steaks that are top of the list. If a restaurant makes a great steak with all the fixings, then this is the place to eat. At Colton’s Steakhouse & Grill in Pittsburg, they say “we know what’s at steak!” And that attitude is reflected in their selection of great steak cuts—sirloin, rib eye, filet, strip, porterhouse, all cooked over mesquite wood grill. Yum! The Lumber Yard Steakhouse in Zenda is familiar to the locals and a destination for everyone else. The food is good, the service is unbeatable and the Kansas cooked steaks are the best by far. Located in downtown Minneapolis, the Blue Moon Restaurant & Bar is in the back alley behind the Blue Store. It has a timeless atmosphere and a welcoming vibe. The place that serves the best steak dinners around and keeps customers coming back for more. A favorite Kansas steakhouse that is locally owned and operated in Princeton is the Brand N Iron Bar & Grill. This steakhouse grills locally raised beef and is hands-down some the the best steak you will ever eat. An American steakhouse is just what you will find at the North Star Steakhouse in Topeka. A family-oriented steakhouse where the best quality steak are cooked to perfection. There is no place like the North Star.